I have loved wearing charms since I was seven and I received a tiny plastic scotty dog charm from an old bubble gum machine. I wore it on a piece of string around my neck until the string was so dirty, that my Mom threw it away. When I graduated from high school in 1964, one of my aunts gave me a shiny sterling silver linked charm bracelet that had the number 64 placed near the clasp. Thus began my favorite charm bracelet that holds my life experience charms. Each one holds a memory of a significant event. I have collected 65 additional charm bracelets that each has a theme and they are my ongoing "works of art." Some believe that the practice of wearing charms called amulets or talisman for protection, prosperity, fertility or for identity began thousands of years ago. In ancient Egypt, charms were worn by both men and women. The Egyptian charms served two purposes. The living would know the wearer's origins and status by their charms, and the spirit gods of the underworld would know how to guide the wearer to their proper place in the afterlife. Romans wore medallions and other metal charms to identify themselves as citizens of Rome, and to harm a Roman citizen would bring swift retribution. Early Christians wore charms in the shape of a fish under their clothing to identify themselves for secret worship ceremonies. Often times, Jews placed written laws from the Torah on tiny pieces of parchment into amulets and wore them close to their hearts. During the Dark Ages, charms were worn as family crests to identify the wearer, but many more charms were worn as protection against evil spirits. Many credit Queen Victoria of England for setting the trend of wearing decorative metal charms as jewelry. Keeping with the Victorians' love of things representing those found in nature, animal charms made from precious metals and set with precious and semi-precious stones became the rage. Queen Victoria loved wearing heart lockets which contained a lock of hair from her family members, and this practice soon became popular across Europe and in America. During this period of the late 19th and early 20th Century, slide charms set with semi-precious jewels and strung on parallel thin gold chains became another fad. Mechanical or charms with parts that moved or opened also appeared during this time. Coins were often used as charms. Some coins were left as issued on one side and the back side was polished smooth and engraved on the other side. Some countries such as the United States passed laws that their coins couldn't be defaced which somewhat stopped the practice. During the 1950s and 1960s, many beautiful bracelets, necklaces, and even belts were produced from Mexican silver coins. I had several bracelets that had been made in Nogales, Sonora, but alas, I have no idea what happened to them. Celluloid and plastic brightly colored "fun charms" were mass produced in the 1930s and 1940s. Charms were packed into boxes of candy and other food items, placed into gum ball machines and sometimes dangled from ribbons placed around the neck of liquor bottles. The liquor bottle charms were most often dog or bird charms. Some are the ivory color of celluloid, but many are brightly colored. Other popular themes during this time were the comic strip characters such as Little Orphan Annie, Popeye, and Mickey Mouse. Charms produced during World War ll are most often made of brass or pot metal because of the shortage of other metals. They tend to be smalled and lighter in weight, and popular themes were military and patriotic such as airplanes, ships, and flags. In the 1950s and 1960s the sale of charms and charm bracelets was at an all time high. 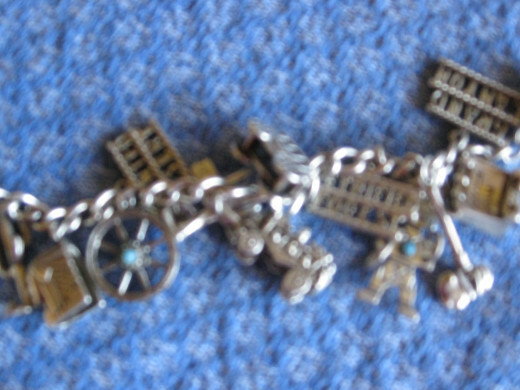 One of the most popular gifts for younger girls was a Ten Commandments charm bracelet. Many charms for high school age girls had a school or sports theme. Batons, cheerleader megaphones and records were very popular. 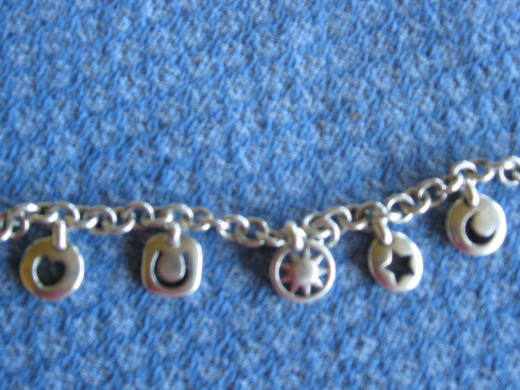 Number charms that reflected a special birthday such as sweet sixteen were mass produced. Other charms were characters representing popular music idols or film or TV stars were produced. Many brides during this period gave a charm bracelet with a Bridesmaid charm to their bridesmaids for a thank you gift. Most souvenir shops carried state map charms in the shape of the states that were produced in bright colors of enamel over sterling silver or other metals. 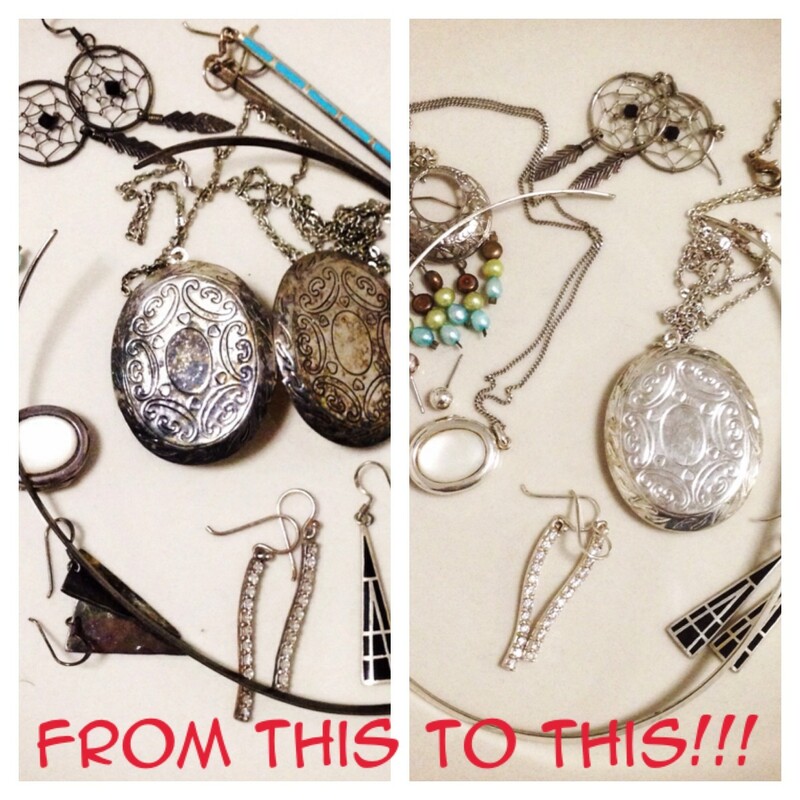 During the 1970s charms had fallen out of favor as fashions were short and the jewelry was massive and clunky. But by the 1980s plastic bell clip charms that clipped onto plastic chains were produced for young girls. These two inch charms were durable and colorful. During the 1990s, flat style Italian charms were sold in mass by stores such as Hallmark. By 2000 designers such as Louis Vuitton produced a line of exquisite fine jewelry charms that rekindled an interest in vintage charms. Remember the emergence of the jeweled "baby shoes" that was followed by shoe charms and then purse charms? Tiffany has produced a wonderful line of charms and produces Christmas and winter themed charms each year. These are not a casual purchase for most buyers. The last two Tiffany charms I purchased were almost $200 each, but well worth it. 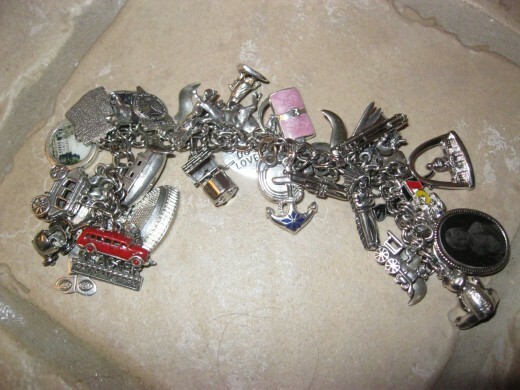 Chicos and J. Jill have also produced charms but have discontinued them. Collectors of vintage charms have driven prices higher and even my plastic bubble gum charms have gained a new respect among collectors. As for those who scoffed at the idea of the ancients who wore charms for superstitious reasons. 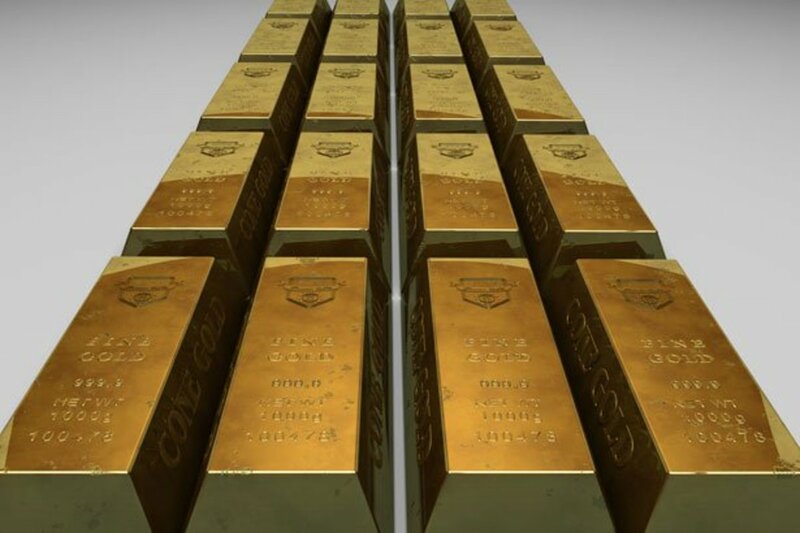 Consider the fact that the most popular charms of all time are still four leaf clovers, horseshoes, wishbones, pigs (prosperity) crosses, hearts for luck in love and a die with seven spots for casino luck. Can beads be charms? Given the success of companies like Brighton and Pandora bead charms, they sure can. 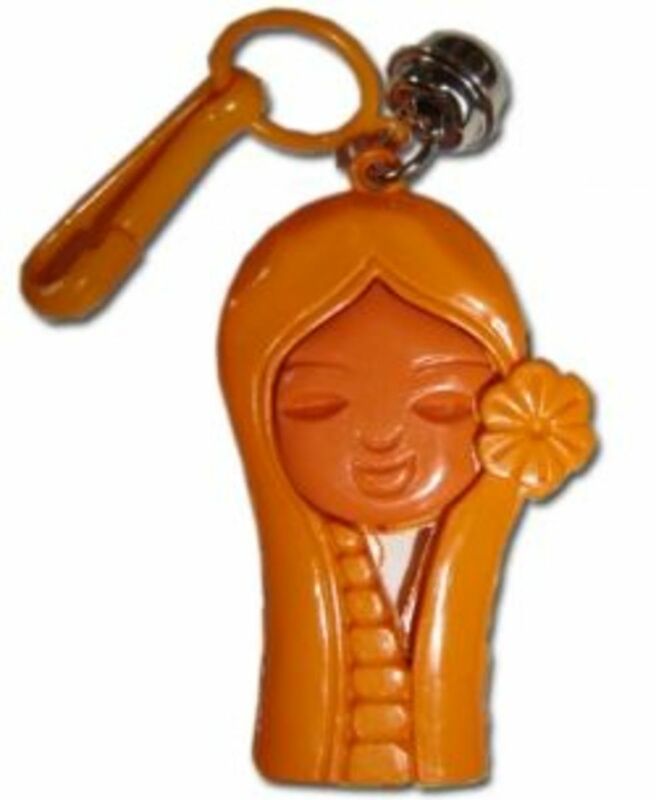 Ever since the Brighton Co began in 1991 in Industry California, they have successfully produced many forms of charms. While their first charms were traditional dangle, attached charms, they were and still are successful with marketing, clip, slide and bead charms for every occasion. They have produced completed charm bracelets such as their state theme bracelets, but more popular is the concept of buying a bracelet or holder and allowing each person to create a piece of jewelry to reflect their personal taste. The charms they have produced for holiday themes are my favorites. I can't pass on their cute Christmas charms. It's fun to combine the dangle designs with the glitzy beads which can be changed at will without the cost of having them permanently attached. Pandora beads and charms which are more expensive than Brighton are well crafted and offer a variety of colors and designs. Waxing Poetic charms beginning with their alphabet charms offer a different vintage appeal. I tend to wear their charms on necklace chains. The current charm trend is stacked thin wire bracelets with charms that dangle from them. One thing is certain, collectors will continue to collect those charms that create a personal piece of jewelry that reflects a moment or a memory. 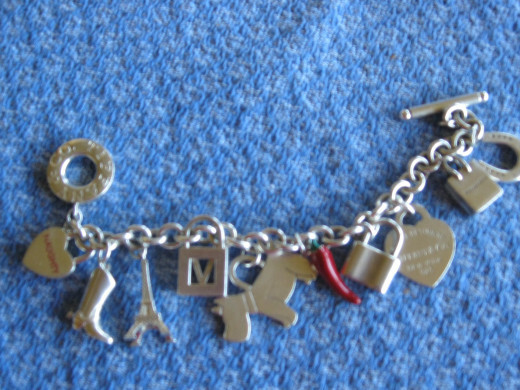 If you have a special charm bracelet, how often do you wear it. Thanks Moonlake. I hope you enjoy wearing your charm bracelet. So many people tell me that they have kept theirs, but never wear it. Go figure! 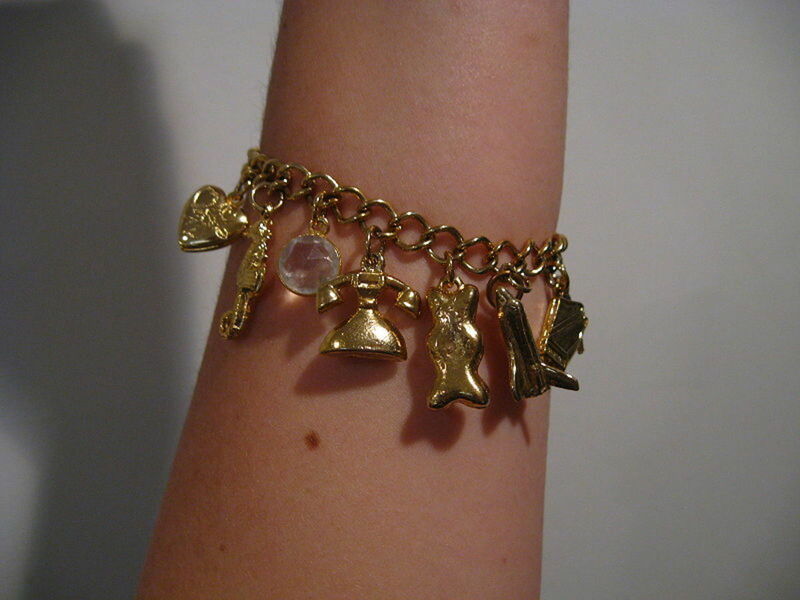 My charm bracelet looks almost exactly like yours. My husband bought it for me years ago. When I was young I use to wear a Ten Commandments charm. Still have it. Enjoyed your hub. What a beautiful bracelet...I can see that is must have a lot of meaning for you.